Both Economic Sophisms and What Is Seen and What Is Not Seen share similar stylistic features and were written with much the same purpose in mind, to disabuse people of misperceptions they might have had about the benefits of free trade and free markets. Throughout the book, Bastiat’s clever and witty arguments against tariff protection and subsidies to domestic industry are timeless, as governments and vested-interest groups are still advocating the same policies 160 years after Bastiat wrote. To accompany Bastiat’s original works, we have provided detailed and comprehensive explanatory footnotes, glossaries, and appendixes. Bastiat refers to dozens of other writers and politicians and is critical of French government policies regarding taxation, tariffs, and subsidies to business. 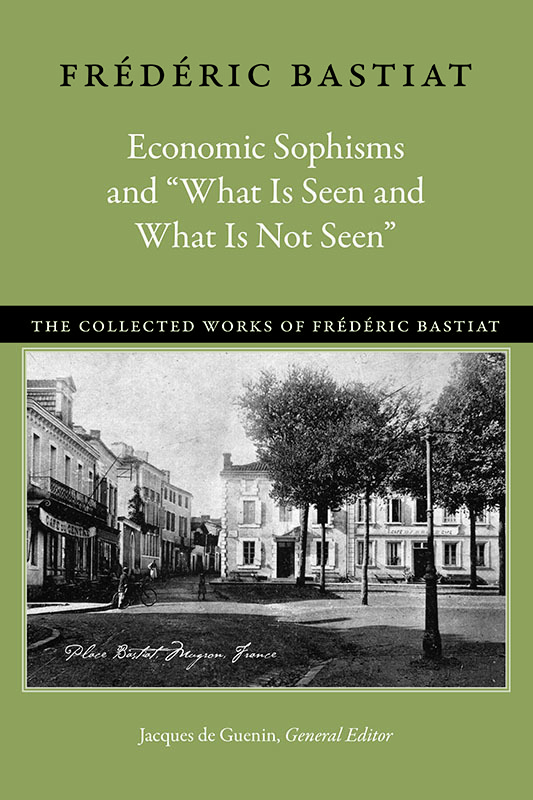 The glossary of authors and politicians provides detailed information about the individuals Bastiat mentions in his essays, the views they held, the books they published, and the laws that the French state enacted in order to maintain the system of protection and subsidies that Bastiat and the other free-market economists so strenuously opposed. This collection of supplementary material allows us a better understanding of the community of economists and politicians of which Bastiat was a part in the late 1840s. Jacques de Guenin founded the Cercle Frédéric Bastiat in 1990. He had degrees in science from the University of Paris and from the University of California, Berkeley, and was the author of The Logic of Classical Liberalism. Dennis O’Keeffe was Professor of Social Science at the University of Buckingham and Senior Research Fellow in Education at the Institute of Economic Affairs, London. Jean-Claude Paul-Dejean is a Bastiat scholar and a historian at the University of Bordeaux. Foreword, general editor's note, note on the translation, key terms, note on the editions of the OEuvres complètes, abbreviations, chronology, introduction, note on the publishing history, maps, appendixes, addendum, glossaries, bibliographical note on works cited, bibliography, index.